Did Tom Brady Skip OTAs to Play Golf? 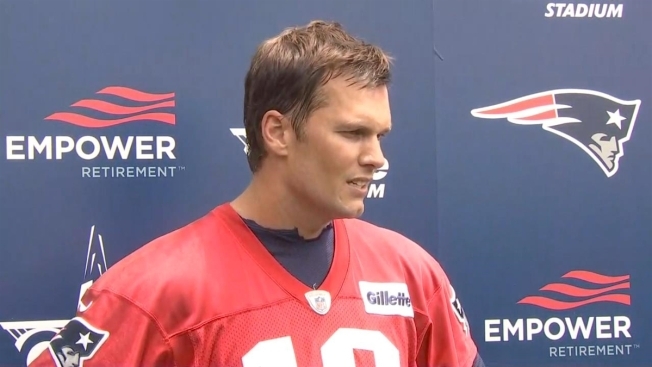 Patriots quarterback Tom Brady answers questions at minicamp, including why he missed voluntary OTAs and about his relationship with head coach Bill Belichick. While his teammates were participating in voluntary organized team activities, New England Patriots quarterback Tom Brady spent Tuesday playing golf with Phil Mickelson. According to the Golf Channel, Brady played with Mickelson, Rickie Fowler and investment banker Jimmy Dunne at Friar's Head Golf Club as Mickelson and Fowler gear up for this weekend's U.S. Open golf tournament. The L.A. Times confirmed the report with Fowler, who told them "Tell you what. Tom Brady can putt." The 40-year-old Brady's absence from voluntary team activities has been a hot topic this offseason. He attended last week's mandatory minicamp, but chose to skip all three voluntary workouts, which he has typically attended in the past. The Patriots held team-building activities Monday and practice on Tuesday before deciding to cancel Thursday and Friday's OTAs. Brady and tight end Rob Gronkowski were notably absent. Some have speculated that this year's absence from voluntary workouts was related to growing tension between Brady and head coach Bill Belichick stemming from the coach's decision to ban Brady's trainer and business partner, Alex Guerrero, from the sidelines during games. The U.S. Open tees off Thursday and runs through Sunday. Neither Mickelson nor Fowler have ever won, so we'll have to see whether Brady can be their good luck charm.